gravitational force with the energy derived from the nuclear fusion. If a giant star of tens of solar masses consumes the nuclear fusion-derived fuel completely, it can no longer endure its self-weight, resulting in collapse. Super large gravitational forces cause distortion in the surrounding space-time, making it impossible for any substance or material (even light) to go out. A black hole is considered to be formed in this way. In outer space where stars are distributed in a high density, the thus-formed black holes merge with each other, gradually growing in size to become giant black holes of more than million solar masses. If one of such supermassive black holes takes up the surrounding stars into it one after another, there arises a spiral of the residues and gases from the crushed and heated stars around the black hole, leading to the formation of a brightly shining disc. This disc, with brightness comparable to that of the entire galaxy composed of 100 billion stars, is visible as a celestial object called an “active galactic nucleus (AGN).” AGN is sometimes accompanied by a pair of narrowly focused flows of plasma, which are 100 thousand light-years long and are called a “jets.” The jets are flows of plasma created by a giant black hole, moving at a flow rate close to the light speed. The jets flowing in the inter-galactic space gradually decreases in speed, eventually forming a drift called “radio lobe.” The radio lobe spans 100 thousand light-years. If investigated in detail, this lobe provides information about the substances/materials carried outwards by the jet and the total energy, thus giving hints to understanding of the one million-year history of AGN. 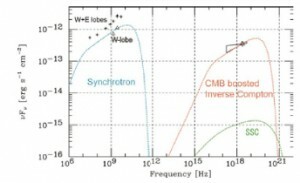 Radio lobe serves as a source of strong radio waves and simultaneously emits X-rays. This fact was unveiled by our observation in 1995 using the Japanese X-ray astronomy satellite “ASCA.” If the data from observation of radio waves are combined with the data from observation of X-rays, we may obtain a useful hint to clarification of total energy of electrons and magnetic fields. Because the plasma constituting the radio lobe gives energy to the space-filling residual light of the big bang (cosmic microwave background radiation), resulting in generation of X-rays, we can measure the electron energy through the X-rays. At the same time, since the electrons produces radio waves with the weak inter-galactic magnetic field, we can estimates the field strength by observing radio waves. The radio lobes archives the AGN history described with the jets. We are attempting to clarify how the space was formed as we see through tracing the history of AGN and its jet by studying the radio lobe at diverse stages of evolution. Which kind of celestial object is a black hole? The giant black hole “active galactic nucleus” possesses a giant jet of one million light-year length. I want to investigate such a giant/powerful jet to understand the space-time of black holes accelerating the jet as well as its changes over time. Jet celestial objects will be selected on the basis of the findings from observation with radio interferometers. 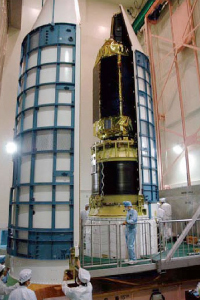 Observation with an X-ray astronomy satellite is performed for detailed investigation of plasma. 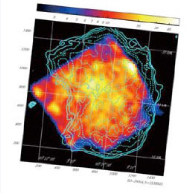 Energy density distribution of jet-derived plasma is determined through combining the data from radio observation and X-ray observation. Changes in jet and giant black holes over one million years are discussed through investigation of jets of varying sizes. Catching Black Holes by High Sensitivity Observation!! High-sensitivity X-ray imaging devices are indispensable to investigate the X-ray releasing areas of black holes. 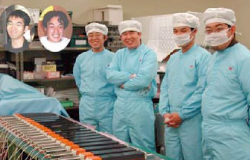 The X-ray astronomy satellite “Asuka,” launched in 1993, was equipped with an X-ray imaging spectroscope with minimal noise developed by us. It enabled several innovative discoveries. 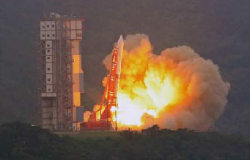 The satellite “Suzaku,” which followed “Asuka,” was fitted with a higher sensitivity astronomy device “HXD.” It confirmed the findings by “Asuka” and advanced them into observation of higher energy electrons. What is the HXD Unit? The X-ray detection unit of “HXD” made of BGO crystals was hand-made together with our graduate students. BGO is an artificial crystal used also for healthcare (e.g., X-ray CT scan). This crystal emits light when exposed to X-ray. This light is converted with a photomultiplier tube into electric signals. 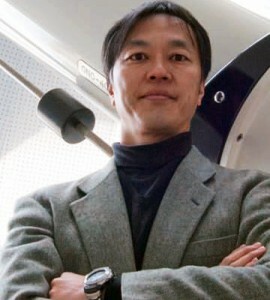 “Suzaku” is equipped also with an X-ray CCD camera developed at MIT, Kyoto University, and Osaka University. This camera is capable of reading out each photon of X-rays and measuring its wavelength. X-ray pictures were taken with this camera combined with the X-ray telescope developed at NASA and Nagoya University. The graph given below plots the magnitude of electromagnetic wave (Y-axis) against the frequency of electromagnetic wave observed (X-axis). The marks indicate the results of observation, and the red and blue dotted lines show theoretical predictions. This study revealed that X-rays with higher power than conventionally anticipated were being released from the “electron lobe.” If the path of electrons is curved in the magnetic field, electric wave radiation occurs (the part colored blue in the graph), and if electrons collide with the space-filling photons (remaining after the big bang and called “background microwave radiation”), X-rays are created (the part colored red). “Suzaku” caught high-energy X-ray and elucidated these two processes through combining this finding with the results of electric wave observation. In this way, it enabled precise measurement of electron energy within the “radio lobe.” It was thus shown that the plasma released from the jet is a flow of at least several times higher energy than the flow conventionally estimated from observation of electric waves alone. Furthermore, comparison of radio galaxies at varying stages of evolution has begun to yield signs of gradual attenuation of the release of jets over time after a certain period of relatively constant intensity jet release. Stars are created one after another at the center of a galaxy, and they shine brightly. When a star reaches its terminal stage, it undergoes supernova explosion, and the blown-off remains of the star form winds of plasma released in upper and lower directions from the center of the galaxy. The black holes remaining at the center of supernova explosion gradually merge with each other to form a giant black hole. It is more than one millions times larger than the sun in terms of mass but is comparable to the sun in terms of size. Thus, a gravitational field is created, with its power becoming greater as the size decreases relative to the weight. The black hole is surrounded by a disc-shaped sphere of gas. Jet flows from the upper and lower parts of the disc-shaped sphere around the black hole, resembling the stream of water from fountains. The jet flow is more than 10 times the galaxy in length (sometimes 1 million times the galaxy). When the “baby boom” of stars seen during the early phase of a galaxy ends, absorption into the black hole decreases, and the activity gradually weakens, resulting in an ordinary galaxy. © Copyright Saitama University, All Rights Reserved.